But whose table is this? Keeping seasoned horror movie viewers off balance is a difficult thing to do. Audiences have certain expectations, so quenching the desire for gore, jumps, or spine tingles while also bringing something new to the experience is tricky. The thrills of At the Devil’s Door come in how it absorbs the rhetoric of a demonic chiller and reveals its narrative and themes (and jumps) in unconventional ways. With his sophomore effort (following 2012’s The Pact), writer-director Nicholas McCarthy creates an atmosphere of general disquiet that nimbly alternates perspectives and protagonists. While several genre beats are familiar, the minutiae aren’t nearly as important as the method. At the Devil’s Door knows where you think things are going and suddenly, yet quietly, takes you somewhere else. It’s a distressing mood piece with a fresh, determined attitude. A teen girl (Ashley Rickards) is persuaded by a summer boyfriend to do something she seems to believe is selling her soul for $500. After indulging a creepy stranger in his shell game, the girl is told to say her name aloud so “he” can find her. The title might give a clue as to “he” is. Soon, the girl is seeing things and levitating, surely in the devil’s grasp. Kinda takes the shine off the bright red Reeboks she purchased in exchange for eternal damnation. Cut to go-getter real estate agent Leigh (Catalina Sandino Moreno), who agrees to list the home of a couple that’s eager to get the hell out of it. The couple has financial problems and tells Leigh their daughter has run off. When Leigh performs her first inspection, the house is definitely familiar to us (as is the girl in the red raincoat skulking about), but the walls have some ominous new burn marks. 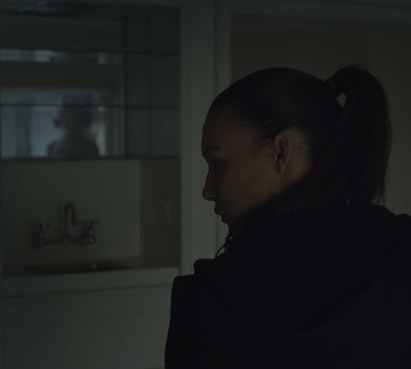 As the mysteries surrounding her new listing deepen, Leigh attempts to connect with her emotionally distant younger sister Vera (Naya Rivera), who’s also drawn into the creepy goings-on. 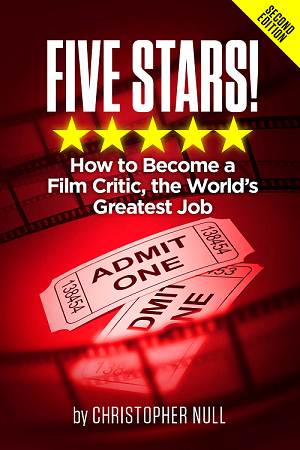 To know too much more going in would deprive you of the joys/terrors of the film’s twists and turns. One of the great things about the revelations is that McCarthy doesn’t treat them as revelatory. Events simply unfold as they do without pause for astonishment, underscored by dim lighting and a throbbing score that mixes with foreboding ambient sounds to intensify the nerve shredding. The camera frequently moves forward, drawing us to people or objects that would, in a lesser thriller, lead us directly to, or distract us from, the next jolt. Except here, sometimes there’s a shadowy figure that appears in the mirror and sometimes there isn’t; not in a false-scare “gotcha” kind of way, but in a try-and-guess-when-it’s-coming, unsettling kind of way. We (probably) know something is going to happen when one of our heroines investigates a kitchen cabinet via cell phone light, and when it finally does, it’s terrifying. Just as with the scares, the film is efficient with its characters. We understand the stories of the three female leads without having to endure arduous exposition. Rickards’ teen is the product of a non-supportive environment and is desperate to belong. Leigh and Vera are daughters of immigrants, the former saddened by the state of the economy and her lack of a nuclear family. Loner artist Vera appears to only interact with anyone out of carnal need or familial duty. All of them are searching for their place – which suggests the connection to the film’s original title of Home – and while screen time is spread a little thin amongst the trio and is episodic by design, we’re still invested in what happens to them as they unadvisedly venture down darkened hallways alone. The malevolent presence in the shadows is also looking for its happy place, which happens to cause nothing but pain and anguish for those it encounters. There’s grim allegory here that gets deeper under the skin than typical horror machinations, driven by an overwhelming feeling of dread and a sensible use of shock and story. A lot is stuffed into the 91 minutes of At the Devil’s Door, and there’s a lot to unpack, and recover from, when it’s over.